For the past 10 years, Andrew Sullivan at The Atlantic magazine has run an extremely popular issues blog, the Daily Dish. Beginning in March 2009, one reader emailed in a comment about using marijuana, and since then, what has been known as the Cannabis Closet has become one of the most popular features on the blog and a cultural locus for discussion of marijuana use and the pot laws. In The Cannabis Closet, Daily Dish executive editor Chris Bodenner has compiled illustrative examples of the reader-created content on that blog thread, and in so doing, he has allowed those readers to paint a portrait of marijuana and its hidden place in American culture. There are testimonials from wealthy entrepreneurs who like nothing better than a relaxing night hitting the bong and playing video games and from students for whom smoking pot proved problematic. There are reports from responsible parents and, arguably, at least one irresponsible one. One parent wrote in to relate how he grew his own plants and allowed his four-year-old daughter to help trim the fan leave. That led at least one other reader to write in all aghast. And so it goes in The Cannabis Closet. It is, after all, a reader-created thread, and there is sometimes interesting back and forth. One reader complains that he must forsake working for the FBI for fear of failing a drug test; another rakes him over the coals for his hubris in thinking he can pick and choose which laws to obey. The Cannabis Closet is divided into chapters that reflect the manifold nature of the marijuana experience in contemporary America. It opens with readers' experiences of pot, cracking open the closet door, if not exactly coming out, since all of the contributors are anonymous and few of them were volunteering to go public with their pot use. The opening is followed by chapters on parenting, getting busted, forsaking certain careers, addiction, coping (medical use), and being an out user in places where it's safe to be one. While most respondents found using marijuana pleasurable (at least for awhile), pot had ill effects on some people. Some users found themselves growing paranoid or anxious and quit, while for others, smoking dope was counterproductive. Marijuana missionaries notwithstanding, it only makes sense that pot isn't for everybody or, that as a psychoactive substance, it can cause problems for some people. But as for marijuana addiction, one reader hit it right on the nose: "Addiction is never about the drug," he wrote, "It's about people coming to grips with the pain of existence." And as a drug reform activist, that makes me impatient. The Cannabis Closet's contributors took the time to share their experiences and make the book possible. But have they taken other actions to change the status quo -- political actions like lobbying legislators or donating to groups that are working to change the laws? None mentioned doing so, though all acknowledge prohibition's absurdity. Perhaps they have and we just don't know; that isn't what they were asked about. What we do know is that extremely few, proportionally, of the millions inhabiting the world's larger cannabis closet, do more than enjoy their pot and bemoan its prohibition. And why not? Perhaps because they are insulated from prohibition's worst consequences. As one Dish reader cogently observed, he feels perfectly safe smoking pot while walking down the street in Manhattan. But there is injustice in that too -- the same reader knows this is only because he's white and middle class. If the great silent majority who think pot is no big deal would actually arouse itself, change would come pretty quickly. But if they stay content to sit at home and sneak a puff or two, it's going to take all the longer. 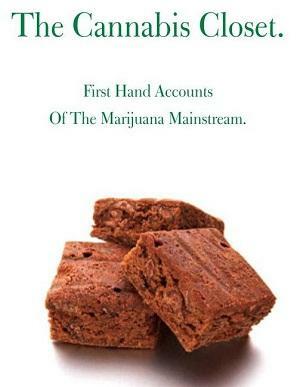 In the meanwhile, the Daily Dish has moved things further by getting the good burghers of America to at least crack open the closet door and talk honestly about what we all know about marijuana -- on their widely-read web site, and now in Cannabis Closet the book. If we are going to get marijuana prohibition ended -- and we are -- that is part of the process. The Cannabis Closet thus has provided a real service, while also demonstrating how far we have to go. By far, marijuana prohibition's worst consequences continue in prolonged, imposed essential resource scarcity. A lie thinly applied conveys guilt-by-confusion and disingenuous relationship enough to cripple organic agriculture. By criminalizing so-called "industrial" hemp protein, herbal therapeutics, cellulose and fiber production, imbalances have resulted from the toxic substitutes that have been forced on the gullible and unsuspecting public. The final argument comes down to climate change. Cannabis is the best available affordable timely response to increasing UV-B radiation. That ends any argument about legal or illegal, tax or not to tax. It's about survival. If we're committed to evolution by the light of truth, then, once again, Cannabis is our best choice for lighting that lamp. Some readers might find Paul's statements exaggerated-- how could cannabis, of all things, be the "best" and most strategic of all plant life from so many vantage points? But actually what he says about hemp is no more exaggerated than the things we consider it normal to say about homo sapiens-- we consider "ourselves" the wisest and evolutionally most advanced animal, and there are arguments to support that. In brief, not only have we evolved the famous endocannibinoid receptors, but the cannabis sativa plant has co-evolved features borrowed from us. After all, starting tens of thousands of years ago somewhere in Asia, humans dragged hemp plants to their lairs-- or huts or houses--- for roof thatching or just for the cookstove ("in the sweat of thy brow (smoky in mom's kitchen" thou shalt eat bread"). And some of those little seeds fell on dung piles near the house-0- and the rest, as Philip says, is history (though in the closet till now). You can still buy the book at Blurb.com for only $5.95 (and be sure to use the promo-code DISH for $3 off shipping). "Tell a lie loud enough and often enough and it becomes the truth". A quote from who? Adolf Hitler, that`s who. Way too many Americans are terrified of speaking their mind when it comes to Cannabis. Fear of being demonized as an evil pot smoker. "Death bush" consumers. Criminals of the worst kind. HAHAHAHAHAHA. Hypocrisy in full un-adulterated action. Got Balls? Got Morals? Got Common Sense? Then stand up and be a Man and speak your mind. Expose the cowards that push the drug war onto you. Steal your tax $$$ to pay their salaries. GOD did not give man the spirit of fear. GOD gave man the spirit of POWER. To hell with the devil, satan, lucifer. For the devil has become my footstool. The power of truth is yours to embrace or deny. It`s up to you . Country in the world and we have more prisoners in our Jails for drugs than anyone can really imagine (until it happens too them) and with the laws we have how could any smart person not keep quite . If they become an activist they could go to jail and probably will unless they can quit using the drug they prefer , or need to keep sane ,or walk. They have made it into a catch 22 of truly evil consequences. End the War now Please Speak up and go to PRISON in our Land of the Free and home of the ashamed !! Remember If you are doomed to hide in the closet they do have them with bars, and all it will cost you is everything you own and they even take your kids ! no wonder everyone is afraid , how do I delete this ? This article is in reality about the Solar framework and its related certainties. I found a ton of essential focuses which I don't know before comes this site about sun- powered board. Be that as it may, I require a site for rushmyessay but there is good and most useful information about the above topic here.